CHAPTER VIII. MAUDSLEY'S PRIVATE ASSISTANT. On the morning of Monday, the 30th of May 1829, I commenced my regular attendance at Mr. Maudsley's workshop. My first job was to assist him in making some modifications in the details of a machine which he had contrived some years before for generating original screws. I use the word "generating" as being most appropriate to express the objects and results of one of Mr. Maudsley's most original inventions. It consisted in the employment of a knife-edged hardened steel instrument, so arranged as to be set at any required angle, and its edge caused to penetrate the surface of a cylindrical bar of soft steel or brass. This bar being revolved under the incisive action of the angularly placed knife-edged instrument, it thus received a continuous spiral groove cut into its surface. It was thus in the condition of a rudimentary screw; the pitch, or interval between the threads, being determined by the greater or less angle of obliquity at which the knife-edged instrument was set with respect to the axis of the cylindrical bars revolving under its incisive action. The spiral groove, thus generated, was deepened to the required extent by a suitable and pointed hard steel tool firmly held in the jaws of an adjustable slide made for the purpose, as part and parcel of the bed of the machine. In the case of square-threaded screws being required, a square-pointed tool was employed in place of the V or angle-threaded tool. And in order to generate or produce right hand or left hand screws, all that was necessary was to set the knife-edged instrument to a right or left hand inclination in respect to the axis of the cylindrical bar at the outset of the operation. This beautiful and truly original contrivance became, in the hands of its inventor, the parent of a vast progeny of perfect screws, whose descendants, whether legitimate or not, are to be found in every workshop throughout the world, where first class machinery is constructed. The production of perfect screws was one of Maudsley's highest ambitions and his principal technical achievement. It was a type of his invaluable faculty of solving the most difficult problems by the most direct and simple methods. It was by the same method that he produced the Guide screw. His screw-cutting lathe was moved by combination wheels, and by its means he could, by the one Guide screw, obtain screws of every variety of pitch and diameter. As an illustration of its complete accuracy I may mention that by its means a screw of five feet in length and two inches in diameter was cut with fifty threads to the inch; the Nut to fit on to it being twelve inches long, and containing six hundred threads! This screw was principally used for dividing scales for astronomical and other metrical purposes of the highest class. By its means divisions were produced with such minuteness that they could only be made visual by a microscope. This screw was sent for exhibition to the Society of Arts. It is still preserved with the utmost care at the Lambeth Works amongst the many admirable specimens of Henry Maudsley's inventive genius and delicate handiwork. Every skilled mechanic must thoroughly enjoy the sight of it, especially when he knows that it was not produced by an exceptional tool, but by the machine that was daily employed in the ordinary work of the factory. I must not, however, omit to say that I took an early opportunity of presenting Brougham's letter of introduction to Faraday at the Royal Institution. I was received most cordially by that noble-minded man, whose face beamed with goodness and kindness. After some pleasant conversation he said he would call upon me at Maudsley's, whom he knew very well. Not long after Faraday called, and found me working beside Maudsley in his beautiful little workshop. A vice had been fitted up for me at the bench where he himself daily worked. Faraday expressed himself as delighted to find me in so enviable a position. He congratulated me on my special good fortune in having the inestimable advantage of being associated as assistant workman with one of the greatest mechanical engineers of the day. Mr. Maudsley offered to conduct Faraday through his workshops, and I was permitted to accompany them. I was much impressed with the intelligent conversation of Faraday, as well as with the quickness he exhibited in appreciating not only the general excellence of the design and execution of the works in progress, but his capacity for entering into the technical details of the composite tools and machinery which he saw during his progress through the place. This most pleasant and memorable meeting with the great philosopher initiated a friendship which I had the good fortune to continue until the close of his life. It was, of course, an immense advantage for me to be so intimately associated with Mr. Maudsley in carrying on his experimental work. I was not, however, his apprentice, but his assistant workman. It was necessary, therefore, in his opinion, that I should receive some remuneration for my services. Accordingly, at the conclusion of my first week in his service, he desired me to go to his chief cashier and arrange with him for receiving whatever amount of weekly. wages I might consider satisfactory. I went to the counting-house and had an interview with Mr. Young the cashier, a most worthy man. Knowing as I did the great advantages of my situation, and having a very modest notion of my own worthiness to occupy it, I said, in answer to Mr. Young's question as to the amount of wages I desired, that "if he did not think ten shillings a week too much I could do well enough with that." "Very well," said be, "let it be so." And he handed me over half-a-sovereign! I had determined, after I had obtained a situation, not to cost my father another shilling. I knew how many calls he had upon him, at the same time that he had his own numerous household to maintain. I therefore resolved, now that I had begun life on my own resources, to maintain myself, and to help him rather than be helped any longer. Thus the first half-sovereign I received from Mr. Young was a great event in my life. It was the first wages, as such, that I had ever received. I well remember the high satisfaction I felt as I carried it home to my lodging; and all the more so as I was quite certain that I could, by strict economy and good management, contrive to make this weekly sum of ten shillings meet all my current expenses. I had already saved the sum of £20, which I placed in the bank as a deposit account. It was the residue of the sale of some of my model steam-engines at Edinburgh. My readers will remember that I brought with me a model steam-engine to show to Mr. Maudsley as a specimen of my handiwork. It had gained for me the situation that I desired, and I was now willing to dispose of it. I found a purchaser in Mr. Watkins, optician at Charing Cross, who supplied such apparatus to lecturers at Mechanics' Institutions. He gave me £35 for the model, and I added the sum to my deposit account. This little fund was quite sufficient to meet any expenses beyond those of a current weekly nature. But I was resolved that my wages alone should maintain me in food and lodging. I therefore directed my attention to economical living. I found that a moderate dinner at an eating-house would cost more than I could afford to spend. In order to keep within my weekly income I bought the raw materials and cooked them in my own way and to my own taste. I set to and made a drawing of a very simple, compact, and handy cooking apparatus. I took the drawing to a tinsmith near at hand, and in two days I had it in full operation. The apparatus cost ten shillings, including the lamp. As it contributed in no small degree to enable me to carry out my resolution, and as it may serve as a lesson to others who have an earnest desire to live economically, I think it may be useful to give a drawing and a description of my cooking stove. 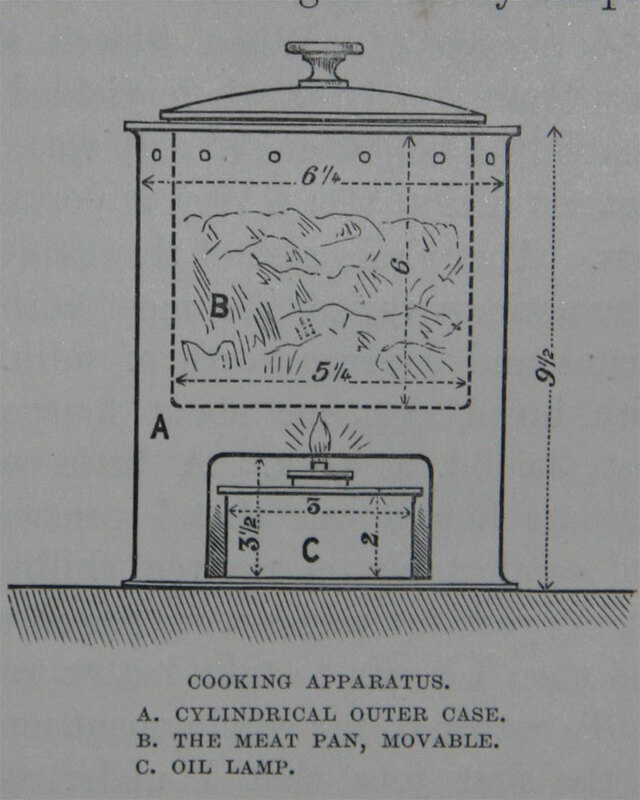 The cooking or meat pan rested on the upper rim of the external cylindrical case, and was easily removable in order to be placed handy for service. The requisite heat was supplied by an oil lamp with three small single wicks, though I found that one wick was enough. I put the meat in the pot, with the other comestibles, at nine o'clock in the morning. It simmered away all day, until half-past six in the evening, when I came home with a healthy appetite to enjoy my dinner. I well remember the first day that I set the apparatus to work. I ran to my lodging, at about four P.M., to see how it was going on. When I lifted the cover it was simmering beautifully, and such a savoury gusto came forth that I was almost tempted to fall to and discuss the contents. But the time had not yet come, and I ran back to my work. The meat I generally cooked in it was leg of beef, with sliced potato, bits of onion chopped down, and a modicum of white pepper and salt, with just enough of water to cover "the elements." When stewed slowly the meat became very tender, and the whole yielded a capital dish, such as a very Soyer might envy. It was partaken of with a zest that, no doubt, was a very important element in its savouriness. The whole cost of this capital dinner was about 4.5d. I sometimes varied the meat with rice boiled with a few raisins and a pennyworth of milk. My breakfast and tea, with bread, cost me about fourpence each. My lodgings cost 3s. 6d. a week. A little multiplication will satisfy any one how it was that I contrived to live economically and comfortably on my ten shillings a week. In the following year my wages were raised to fifteen shillings a week, and then I began to take butter to my bread. To return to my employment under Mr. Maudsley. One of the first jobs that I undertook was in assisting him to make a beautiful small model of a pair of 200 horsepower marine steam-engines. The engines were then in course of construction in the factory. They were considered a bold advance on the marine engines then in use, not only in regard to their great power, but in carrying out many specialities in their details and general structure. Mr. Maudsley had embodied so much of his thought in the design that he desired to have an exact model of them placed in his library, so as to keep a visible record of his ideas constantly before him. In fact, the engines might be regarded as a culmination of his constructive abilities. In preparing the model it was necessary that everything should be made in exact conformity with the original. There were about three hundred minute bolts and nuts to be reduced to the proportional size. I esteemed it a great compliment to be entrusted with their execution. They were all to be made of cast-steel, and the nuts had to be cut to exact hexagonal form. Many of them had collars. To produce them by the use of the file in the ordinary mode would not only have been difficult and tedious, but in some cases practically impossible. To get rid of the difficulty I suggested to Mr. Maudsley a contrivance of my own by means of which the most rigid exactness in size as well as form could be given to these hexagonal nuts. He readily granted his permission. I constructed a special apparatus, consisting of a hard steel circular cutter to act as a circular file. 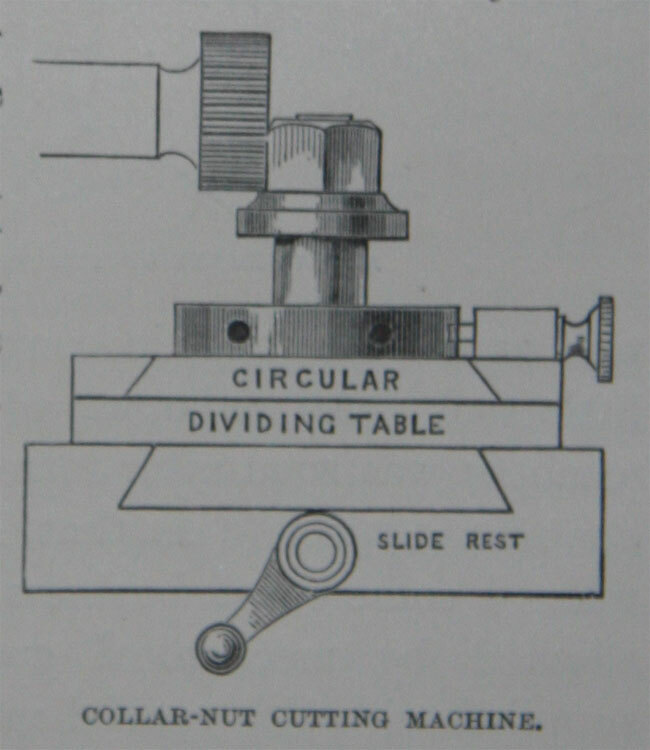 When brought into operation in the production of those minute six-sided collared nuts, held firm in the spindle of a small dividing plate and attached to the slide-rest, each side was brought in succession under the action of the circular file or cutter with the most exact precision in regard to the division of the six sides. The result was absolutely perfect as respects the exactness of the six equal sides of the hexagonal nut, as well as their precise position in regard to the collar that was of one solid piece with it. There was no great amount of ingenuity required in contriving this special tool, or in adapting it to the slide-rest of the lathe, to whose spindle end the file or cutter was fixed. But the result was so satisfactory, both as regards time accuracy and rapidity of execution in comparison with the usual process of hand filing, that Mr. Maudsley was greatly pleased with the arrangement as well as with my zeal in contriving and executing this clever little tool. An enlarged edition of this collar-nut cutting machine was soon after introduced into the factory. It was one of the specialities that I adopted in my own workshop when I commenced business for myself, and it was eagerly adopted by mechanical engineers, whom we abundantly supplied with this special machine. It was an inestimable advantage to me to be so intimately associated with this Great Mechanic. He was so invariably kind, pleasant, and congenial. He communicated an infinite number of what he humorously called "wrinkles," which afterwards proved of great use to me. My working hours usually terminated at six in the evening. But as many of the departments of the factory were often in full operation during busy times until eight o'clock, I went through them to observe the work while in progress. On these occasions I often met "the guv'nor," as the workmen called Mr. Maudsley. He was going his round of inspection, and when there was any special work in hand he would call me up to him and explain any point in connection with it that was worthy of particular notice. I found this valuable privilege most instructive, as I obtained from the chief mechanic himself a full insight into the methods, means, and processes by which the skilful workman advanced the various classes of work. I was also permitted to take notes and make rapid sketches of any object that specially interested me. The entire establishment thus became to me a school of practical engineering of the most instructive kind. Mr. Maudsley took pleasure in showing me the right system and method of treating all manner of materials employed in mechanical structures. He showed how they might be made to obey your will, by changing them into the desired forms with the least expenditure of time and labour. This in fact is the true philosophy of construction. When clear ideas have been acquired upon the subject, after careful observation and practice, the comparative ease and certainty with which complete mastery over the most obdurate materials is obtained, opens up the most direct road to the attainment of commercial as well as of professional success. To be permitted to stand by and observe the systematic way in which Mr. Maudsley would first mark or line out his work, and the masterly manner in which he would deal with his materials, and cause them to assume the desired forms, was a treat beyond all expression. Every stroke of the hammer, chisel, or file, told as an effective step towards the intended result. It was a never-to-be-forgotten practical lesson in workmanship, in the most exalted sense of the term. Illustrating his often repeated maxim, "that there is a right way and a wrong way of doing everything," he would take the shortest and most direct cuts to accomplish his objects. The grand result of thoughtful practice is what we call experience: it is the power or faculty of seeing clearly, before you begin, what to avoid and what to select. High-class workmanship, or technical knowledge, was in his hands quite a science. Every piece of work was made subject to the soundest philosophical principles, as applied to the use and treatment of materials. It was this that gave such a charm of enjoyment to his dealing with tools and materials. He loved this sort of work for its own sake, far more than for its pecuniary results. At the same time he was not without regard for the substantial evidence of his supremacy in all that regarded first-class tools, admirable management, and thorough organisation of his factory. The innate love of truth and accuracy which distinguished Mr. Maudsley, led him to value highly that class of technical dexterity in engineering workmen which enabled them to produce those details of mechanical structures in which perfect flat or true plane surfaces were required. This was an essential condition for the effective and durable performance of their functions. Sometimes this was effected by the aid of the turning-lathe and slide-rest. But in most cases the object was attained by the dexterous use of the file, so that flat filing then was, as it still is, one of the highest qualities of the skilled workman. No one that I ever met with could go beyond Henry Maudsley himself in his dexterous use of the file. By a few masterly strokes he could produce plane surfaces so true that when their accuracy was tested by a standard plane surface of absolute truth, they were never found defective; neither convex, nor concave, nor "cross winding," — that is, twisted. The importance of having such Standard Planes caused him to have many of them placed on the benches beside his workmen, by means of which they might at once conveniently test their work. Three of each were made at a time, so that by the mutual rubbing of each on each the projecting surfaces were effaced. When the surfaces approached very near to the true plane, the still projecting minute points were carefully reduced by hard steel scrapers, until at last the standard plane surface was secured. When placed over each other they would float upon the thin stratum of air between them until dislodged by time and pressure. When they adhered closely to each other, they could only be separated by sliding each off each. This art of producing absolutely plane surfaces is, I believe, a very old mechanical "dodge." But, as employed by Maudsley's men, it greatly contributed to the improvement of the work turned out. It was used for the surfaces of slide valves, or wherever absolute true plane surfaces were essential to the attainment of the best results, not only in the machinery turned out, but in educating the taste of his men towards first class workmanship. Maudsley's love of accuracy also led him to distrust the verdicts given by the employment of the ordinary callipers and compasses in determining the absolute or relative dimensions of the refined mechanism which he delighted to construct with his own hands. So much depended upon the manner in which the ordinary measuring instruments were handled and applied that they sometimes failed to give the required verdict as to accuracy. In order, therefore, to get rid of all difficulties in this respect, he designed and constructed a very compact and handy instrument which he always had on his bench beside his vice. He could thus, in a most accurate and rapid manner, obtain the most reliable evidence as to the relative dimensions, in length, width, or diameter, of any work which he had in hand. In consequence of the absolute truth of the verdicts of the instrument, he considered it as a Court of Final Appeal, and humorously called it "The Lord Chancellor." This trustworthy "Companion of the Bench" consisted of a very substantial and inflexible bed or base of hard brass. At one end of it was a perfectly hardened steel surface plate, having an absolutely true flat or plane face, against which one end or side of the object to be measured was placed; whilst a similar absolutely true plane surface of hardened steel was advanced by means of a suitable fine thread screw, until the object to be measured was just delicately in contact with it. The object was, as it were, between the jaws of a vice, but without any squeeze – being just free, which could be easily ascertained by feeling. These two absolutely plane surfaces, between which the object lay, had their distances apart easily read off from the scale engraved on the bed of the instrument, in inches and tenth parts of an inch, while the disk-head or handle of the screw was divided on its edge rim into hundredth or thousandth parts, as these bore an exact metrical relation to the pitch of the screw that moved the parallel steel faces of the measuring vice (as I may term it) nearer or farther apart. Not only absolute measure could be obtained by this means, but also the amount of minute differences could be ascertained with a degree of exactness that went quite beyond all the requirements of engineering mechanism; such, for instance, as the thousandth part of an inch! It might also have been divided so far as a millionth part of an inch, but these infinitesimal fractions have really nothing to do with the effective machinery that comes forth from our workshops, and merely show the mastery we possess over materials and mechanical forms. 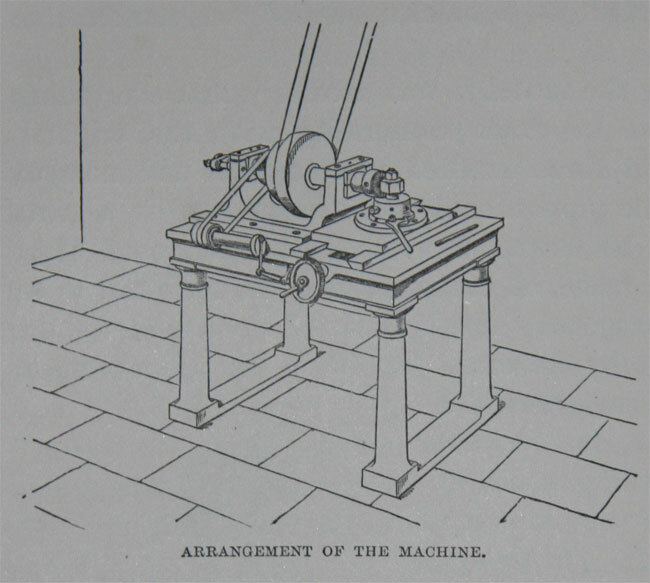 The original of this measuring machine of Maudsley's was exhibited at the Loan Collection at South Kensington in 1878. It is now treasured up, with other relics of his handiwork, in a cabinet at the Lambeth Works. I had abundant occupation for my leisure time after my regular attendance at the factory was over. I had not only the opportunity of studying mechanics, but of studying men. It is a great thing to know the character of those who are over you as well as those who are under you. It is also well to know the character of those who are associated with you in your daily work. I became intimate with the foremen and with many of the skilled workmen. From them I learnt a great deal. Let me first speak of the men of science who occasionally frequented Maudsley's private workshop. They often came to him to consult him on subjects with which he was specially acquainted. Among Mr. Maudsley's most frequent visitors were General Sir Samuel Bentham, Mr. Barton, director of the Royal Mint, Mr. Bryan Donkin, Mr. Faraday, and Mr. Chantrey, the sculptor. As Mr. Maudsley wished me to be at hand to give him any necessary assistance, I had the opportunity of listening to the conversation between him and these distinguished visitors. Sir Samuel Bentham called very often. He had been associated with Maudsley during the contrivance and construction of the block machinery. He was brother of the celebrated Jeremy Bentham, and he applied the same clear common-sense to mechanical subjects which the other had done to legal, social, and political questions. It was in the highest degree interesting and instructive to hear these two great pioneers in the history and application of mechanics discussing the events connected with the block-making machinery. In fact, Maudsley's connection with the subject had led to the development of most of our modern engineering tools. They may since have been somewhat altered in arrangement, but not in principle. Scarcely a week passed without a visit from the General. He sat in the beautiful workshop, where he always seemed so happy. It was a great treat to hear him and Maudsley fight their battles over again, in recounting the difficulties, both official and mechanical, over which they had so gloriously triumphed. At the time when I listened to their conversation, the great work in hand was the organisation of a systematic series of experiments on the hulls of steam-ships, with the view of determining the laws of resistance on their being propelled through the sea by a power other than those of winds and sails. The subject was as complex as it was interesting and important. But it had to be put to the test by actual experiment. This was done in the first place by large models of hulls, so as to ascertain at what point the curves of least resistance could be applied. Their practical correctness was tested by careful experiment in passing them through water at various velocities, to record which conditions special instruments were contrived and executed. These, as well as the preparation of large models of hulls, embodying the various improved "lines," occupied a considerable portion of the time that I had the good fortune to spend in Mr. Maudsley's private workshop. Mr. Barton of the Royal Mint was quite a "crony" of Maudsley's. He called upon him often with respect to the improvements in stamping the current coin of the realm. Mr. Bryan Donkin was also associated with Maudsley and Barton on the subject of the national standard of the yard measure. But perhaps Mr. Chantrey was the most attractive visitor at the private workshop. He had many a long interview with Maudsley with respect to the planning and arranging of a small foundry at his studio, by means of which he might cast his bronze statues under his own superintendence. Mr. Maudsley entered ‘con amore’ into the subject, and placed his skill and experience entirely at Chantrey's service. He constructed the requisite furnaces and cranes, and other apparatus, at Chantrey's studio and it may be enough to state that, when brought into operation, they yielded the most satisfactory results. Among my most intelligent private friends in London were George Cundell and his two brothers. They resided near my lodgings, and I often visited them on Saturday evenings. They were most kind, gentle, and genial. The eldest brother was in Sir William Forbes's bank. George was agent for Mr. Patrick Maxwell Stuart in connection with his West India estates, and the third brother was his assistant. The elder brother was an admirable performer on the violoncello, and he treated us during these Saturday evenings with noble music from Beethoven and Mozart. My special friend George was known amongst us as "the worthy master." He was thoroughly versed in general science, and was moreover a keen politician. He had the most happy faculty of treating complex subjects, both in science and politics, in a thoroughly common-sense manner. His two brothers had a fine feeling for art, and, indeed, possessed no small skill as practical artists. With companions such as these, gifted with a variety of tastes, I spent many of my Saturday evenings most pleasantly and profitably. They were generally concluded with a glass of beer of "the worthy master's" own brewing. When the season of the year and the state of the weather were suitable I often joined this happy fraternity in long and delightful Sunday walks to various interesting places round London. Our walks included Waltham Abbey, Waltham Cross, Eltham Palace, Hampton Court, Epping Forest, and such like interesting places of resort. When the weather was unfavourable my principal resort was Westminster Abbey, where, besides the beautifully-conducted service and the noble anthems, I could admire the glory of the architecture, and the venerable tombs, under which lay the best and bravest. I used generally to sit at a point from which I could see the grand tomb of Aylmer de Valiance in its magnificent surroundings of quaint and glorious architecture. It was solemn, and serious also, to think of the many generations who had filled the abbey, and of the numbers of the dead who lay beneath our feet. I was so great an admirer of Norman and Gothic architecture that there was scarcely a specimen of it in London which I did not frequently visit. One of the most interesting examples I found in the Norman portion of St. Saviour's Church, near London Bridge, though some of it has since been destroyed by the so-called "restoration" in 1831. The new work has been executed in the worst taste and feeling. I also greatly admired the Norman chapel of the Tower, and some Norman portions of the Church of St. Bartholomew the Less, near Smithfield. No style of architecture that I have ever seen has so impressed me with its intrinsic gravity, and I may say solemnity, as that of the Norman. There is a serious earnestness in its grave simplicity that has a peculiar influence upon the mind and I have little doubt but that this was felt and understood by those true architects who designed and built the noble cathedrals at Durham and elsewhere. ↑ I may mention that he was brother to Dr. Thomas Young, the celebrated natural philosopher. ↑ I have this handy apparatus by me still and to prove its possession of its full original efficiency I recently set it in action after its rest of fifty years, and found that it yielded results quite equal to my grateful remembrance of its past services. This page was last edited on 9 June 2008, at 12:20.